VANCOUVER — When the Buffalo Sabres boarded the team charter late Friday night, they left western Canada with the same problem that has plagued them since the season opened more than three months ago. Though the Sabres have the offensive firepower to keep up with the NHL’s best, they make too many makes in their own zone. A remarkable effort to beat Calgary Wednesday was not a magical elixir, either. They allowed 14 goals during the three-game road trip, capped by a 4-3 loss to the Vancouver Canucks in Rogers Arena. Buffalo (24-18-6) earned only two points during its final three games before an extended All-Star break and is four points behind Pittsburgh for the second wild-card spot. Rookie goalie Thatcher Demko stole the game for the Canucks with his 36 saves, including 16 in the third period. He used his mask to stop a Rasmus Dahlin one-timer from the right-wing circle during a third-period Sabres power play. That spoiled a fine offensive game for the Sabres. All four lines generated chances and they outshot Vancouver, 39-23, including 10-4 in the first period. “I didn’t think we were very good tonight,” Canucks coach Travis Green said. Evan Rodrigues, Okposo and Sam Reinhart had goals for Buffalo, which twice tied the score and possessed the puck for most of the game. Linus Ullmark was outstanding despite making only 19 saves. He stopped Josh Leivo’s breakaway late in the third period to keep the deficit at one goal. But the Sabres’ mistakes have been egregious. Rookie defenseman Lawrence Pilut failed to push an opposing forward from in front of the net in the first period, allowing Ullmark to be screened on Alexander Edler’s tying goal at 12:12. Less than four minutes later, Canucks defenseman Derrick Pouliot skated around Pilut and Vladimir Sobotka before making a backhanded pass to Sven Baertschi, who one-timed the puck into the open net. Those goals came after Vancouver was without a shot on goal for the first 9 minutes, 24 seconds of the game. With the score tied 2-2, Pilut turned the puck over to Bo Horvat in the defensive zone, and Horvat set up Brock Boeser for the go-ahead goal eight minutes into the second period. After Reinhart again tied the score entering the third, Leivo’s backhanded pass from behind the net went past Reinhart and Scandella to set up Louis Eriksson’s game-winning goal with 14:03 remaining. The Sabres have won only eight of 23 games since being atop the NHL and have a negative-15 goal differential during that span. That includes 10 one-goal losses. Secondary scoring is no longer their greatest concern. Rodrigues has scored in three consecutive games, Okposo has a goal in two of his last five and Conor Sheary has an assist in three of his last four games. With only 34 regular-season games remaining, the Sabres have a clear identity: they can be prolific offensively but that is not enough to make up for their defensive lapses. Vancouver, now fourth in the Pacific Division at 22-21-6, was without star rookie center Elias Pettersson and had scored only 10 goals in its previous four games without him. It had a negative-13 goal differential this season — Buffalo’s is now negative-4 — and lost four of its previous five games. The Sabres began the road trip with a 7-2 loss to Edmonton in perhaps their worst defeat of the season. Buffalo had only three shots on goal in the third period and overtime Wednesday in Calgary but escaped with a 4-3 win because of Jack Eichel’s goal. 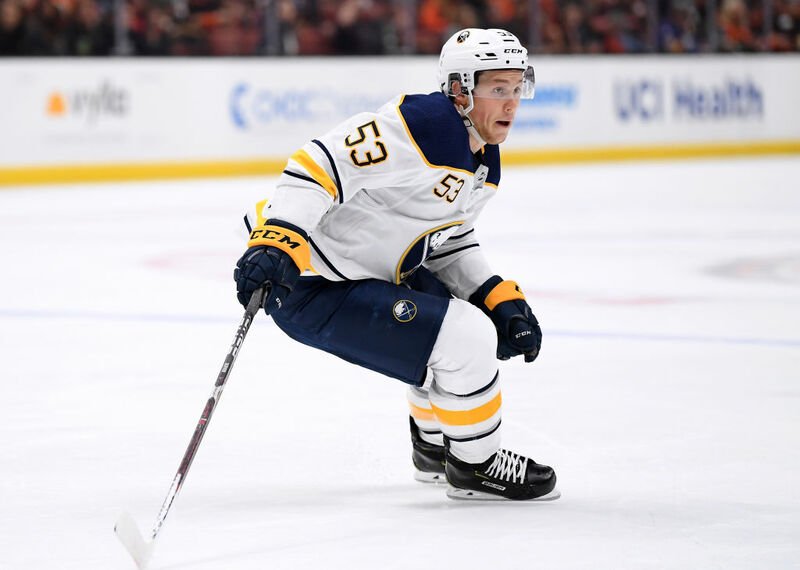 Most of the Sabres will have the next eight days off because of the bye week and All-Star Game, which Eichel and Jeff Skinner will attend. They will then play three games in four nights, including back-to-back road games in Columbus and Dallas. While Buffalo is taking a break over the coming days, some of the teams ahead in the standings will continue to play games. The deficit will surely grow, and the Sabres know they are running out of time to find a solution.